The US Food and Drug Administration (FDA) has declared war on cigarette addiction. This has also resulted in a huge upheaval for the e-cigarette. Under President Obama, the so-called "deeming regulation" regarding e-cigarettes was passed. This regulation has so far only concerned the traditional tobacco cigarette and was extended to the e-cigarette in 2016. Within the framework of this regulation, the sale and use of e-cigarettes and accessories were to be regulated more strictly until 2018. The obvious was also adopted. As in Europe, the sale of e-cigarettes and nicotine-containing products was banned for under-18s and warnings became mandatory. However, each manufacturer should submit a pre-market tobacco application (PMTA), a government approval. This approval was very expensive and had to be submitted for each product, i.e. each liquid of each taste in each nicotine strength. Advertising measures, free samples or indications that steaming was less harmful than smoking should also be a thing of the past. Thus small entrepreneurs and manufacturers saw themselves in danger and above all the tobacco industry as large winners. Many feared even a complete end for the E-Zigarette. The record profits of the big tobacco companies have so far caused share prices to skyrocket. But the tobacco industry recently experienced a slump. Altria, the parent company of Philip Morris, crashed by 19 percent in just one day. How did this happen? The new head of the FDA, Scott Gottlieb, wants to kill nicotine. In a new plan to regulate tobacco and nicotine, he declared that the addictive substance nicotine must be combated more severely. Gottlieb, a medical doctor, explained in his speech that in the USA about half a million people die every year from the consequences of cigarette addiction. In fact, nicotine is a quickly addictive poison and smoking causes harmful combustion processes, which are the main cause of health problems. For example, Gottlieb intends to restrict the nicotine in cigarettes. It remains to be seen whether a lower nicotine content would actually reduce smoking. More importantly, however, the danger posed by tobacco cigarettes is becoming more public and more and more people are looking for alternatives. The nicotine content in liquids should not be changed by the FDA in order to give consumers the option of the much less harmful e-cigarette. In contrast to smoking, no substances are burned when steaming due to lower temperatures. Likewise e-cigarettes would be re-evaluated and tested impartially. 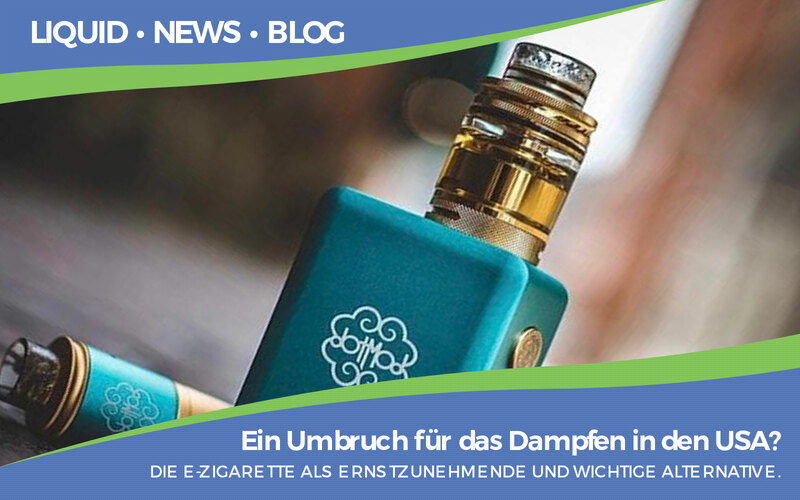 The e-cigarette as a serious and important alternative should minimize health damages. This drastic change of direction in health policy means a major turnaround for the e-cigarette and a huge opportunity for millions of people to switch and stop risking their lives and health.